The popular characters from Friends and Heroes, the award-winning animated adventure series with Bible stories, will be appearing in person at this year's Spring Harvest. 'Real-life' Macky and Portia will be taking part in the 'Big Start' presentations for all-ages at the start of each day, signing copies of their DVDs in the Resource Centre and just popping up around the Spring Harvest site to meet excited children. 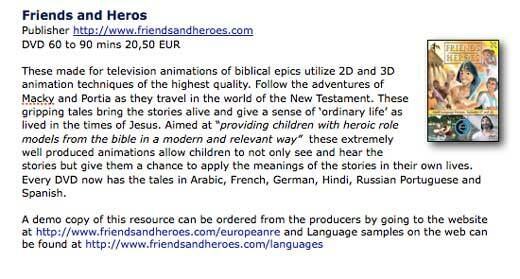 We are thrilled that Sarah Reinhard recently reviewed Friends and Heroes for CatholicMom.com. Sarah said, "It's good enough that my kids are taking Friends and Heroes over Cars and The Little Mermaid." and "I highly recommend this series." We are delighted that this prestigious group of educators across Europe should choose to recommend Friends and Heroes to their members. If you are a European teacher and would like to follow their link for a free Demo DVD click here. You can also click here to see the ten language samples. 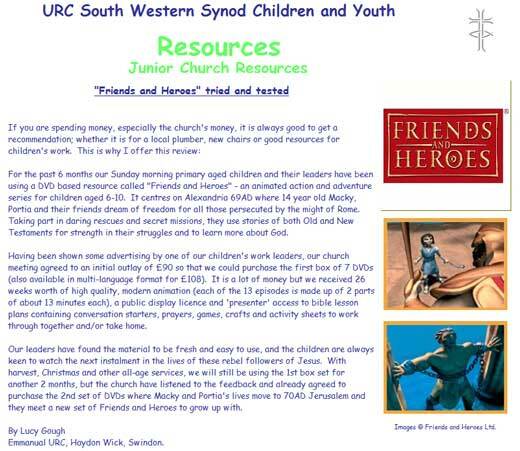 Lucy Gough, leader of "Splat" (Junior Church) at Emmanuel United Reformed Church in Haydon Wick near Swindon, has been using Friends and Heroes for the past six months and she recently sent a review to their local Synod website. She said our Bible Lesson material was "fresh and easy-to-use" and that their children are "always keen to watch the next instalment". The church leadership have now agreed to buy the next Series so it looks like the action in their Junior Church will be moving to Jerusalem soon! Thanks Lucy! The Friends and Heroes coverage continues in this monthly children's magazine. 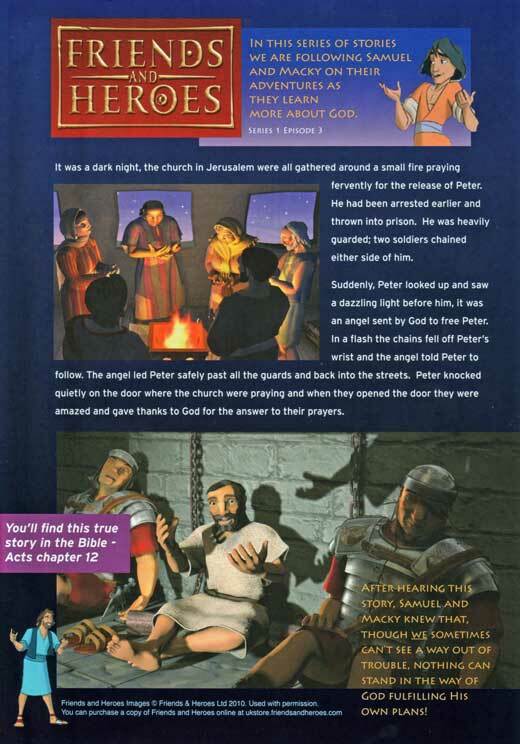 This month our images help to tell the story of God releasing Peter from prison. 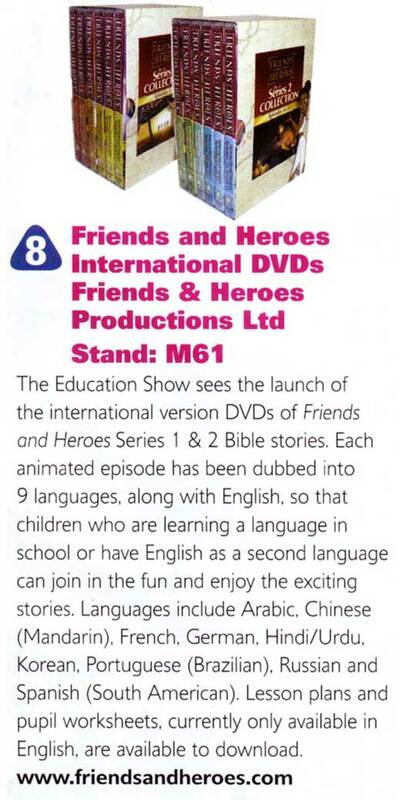 Friends and Heroes was featured in the "10 Things to See at The Education Show 2010" supplement in the Scholastic magazines Child Education Plus and Nursery Education Plus. In fact all THREE Series have now been dubbed into ten languages and are available from our web store here!